“I may have overused DT tool because I conveniently used it in several occasion, and the latest was during a strategic meeting to evaluate a partnership proposal.” – That was my starting remarks when I shared my personal experience using DT tool at genovasi aka (Malaysian DT House). Let me tell you why. Now, why Design Thinking (DT) tool? Simply because it is one of the tools that I learned inside out where with the help of the coaches at genovasi; my team and I learn its application and limitation. Briefly, DT is a human-centered tool where the ultimate focus is to humanize the solution for optimum users satisfaction. You can use this problem-solving tool to create new products, services or in my case to evaluate business proposal. It is humanly possible to learn how to use DT tool and it is also almost impossible for your solution to go wrong if you adopt DT as part of your solutioning design. Nevertheless, just like any tool, DT has its own critics, which I wont touch here. Now let me summarize my own DT experience in the 5 steps and how I used them. At this stage, my team and I discuss the broad view of the Why, What, When, Who, Where and How about this partnership proposal. Since this partner is an international partner, we are very serious in making sure we put all things on the table. I found getting all team members to Check-in help to uncover their emotional state during that discussion. We exchanged numerous questions, choose certain key words and drill down further and help ourselves with coffee and tea at the same time. 😛 We used post-it notes and flipcharts. The purpose of this is simple, to put things up and let everyone see it. It gets everyone involved and be part of the solution. This step is critical in getting everybody on one-page and clarify matters early. This step is explicitly discussed and practiced in DT process. We also ask people outside from our circle and get their feedbacks on partnering with international business ventures. In some occasion we meet to discuss issues surrounding our objectives. Surprisingly, many of the people we met were rich with tacit experience and knowledge in these areas. This is the power of conversation which is hammered on in DT process. We also shared our vision using a journey map to get their thoughts and learn their reservations, which could help us in the long run. We got back from all these interactions and unpack our thoughts and share it out. Of course, as a DT practitioner I don’t really say things like, “Let use DT and unpack”. I use DT tool and processes without acknowledging it, I just guide our session through and it takes several days. Unlike in our program @ genovasi where we have to quickly get it done (because of time limitation), but here I really take them through and get them to buy in especially my team because it takes only one believe that “this is not worth our time” to drop everything. Besides, in the process we also are in on-going communication with the international partners to shape this proposal. In the process, we try to define the Point of View (POV) of our international partners. Navigating the international waters is very challenging with differences in time, culture, communication and perception. I recently learned that a “mediator” in Middle East is understood as “someone that meddle things up”. How about that? So we really need to define the people that we are dealing with and to avoid any prejudice or negative perception. We finally identified several POVs and we agreed to dive further and move forward. With clear POVs and after getting feedbacks from various people, we started to Ideate possible scenarios and situations that would help us uncover some information to validate our assessment. We also internally discuss and sometimes argue whether what we choose is acceptable to avoid any the curse of knowledge and setback of incremental judgment. Just like in other DT session, we allow as many ideas, similarly here where we let people throw in any thinking that come cross their mind. I also let people to ask question so they can substantiate and clarify their idea to gain further understanding. We end up with three scenarios (which remained confidential) and we internally tested them in several engagements. We iterated a few of them and we earned better confident level now. We also build further communication strategy on our prototypes and humanize it further. It is important to always remember that it is not about “us” or/and ‘them”, its always about achieving our mutual goals. This is difficult to do and I have to continuously remind myself, because it is easy to fall trap in either one and forget the goals and objectives. At the end of all this, we need to satisfy both parties hence the goals are sacred to us all. Gladly, we ran several testing session and we are very happy with the results. We make some changes in the prototypes as we learn new information, especially in the POVs. The continuous conversation and discussion internally and externally help us to formulate the right solution to achieve our goals. In conclusion, DT helps me to help my organization making better decision in evaluating this partnership proposal. It improves my ability to exert creative confidence, provoke my own and team thinking, expand the team’s capability, strengthen trust and build strong determination to shape the right solution. Of course, with more practice I would do better in using this tool because human is unpredictable; and that quality makes DT even more interesting as a human-centered tool. It is fluid yet structured, it is fun yet strenuous and it break rules yet build trusts. You can learn DT tool from internet, just Google Design Thinking. There are many courses and article about it right now and its free. You can buy a book on Design Thinking, again just Google or go to bookstores near you. 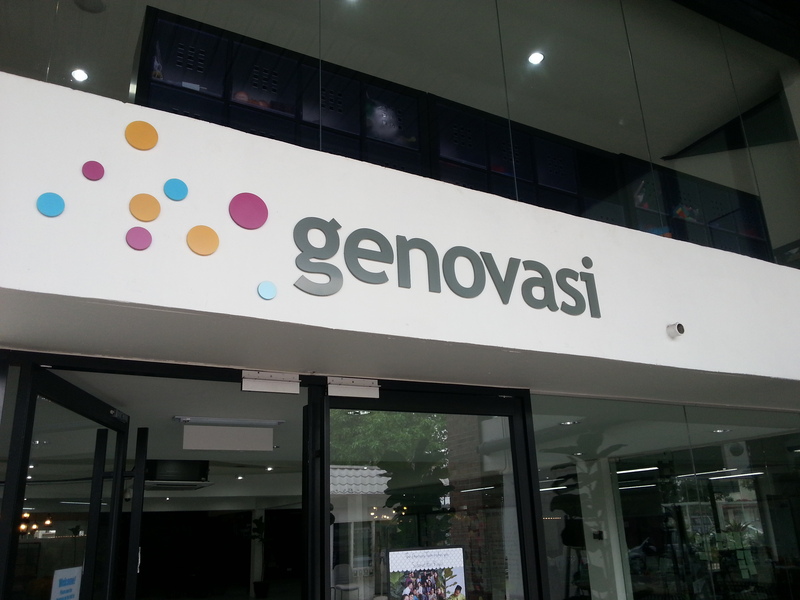 But what truly a big difference in my own DT learning journey was the passion and patience that genovasi coaches have demonstrated throughout 10-weeks of real DT lessons @ Malaysia DT House in Petaling Jaya. This program was in partnership with Hasso Platner Institute (HPI) and it is also taught at Stanford University. I couldn’t be more thankful to Prime Minister’s Department for initiating this awesome program and to let genovasi team be on the driver’s seat to drive this – they are just the right team and at the right time. My sincere thank you and big-hearted congratulations go to The Ultimate Genovasi Team; Carol Wong, Mahadzir, Azman, Michelle, Mike, Foong Wai, Firdaus, Suyin, Teck Hin, Jun-Elle, Fazlina, Genie, and not forgetting our Outreach Project Partner (OPP) and also other genovasi team members. Special thanks to all IADP 3D intakes members, you guys rawks!